In Stick Together and Come Back Home, Patrick Lopez-Aguado examines how what happens inside a prison affects what happens outside of it. Following the experiences of seventy youth and adults as they navigate juvenile justice and penal facilities before finally going back home, he outlines how institutional authorities structure a “carceral social order” that racially and geographically divides criminalized populations into gang-associated affiliations. These affiliations come to shape one’s exposure to both violence and criminal labeling, and as they spill over the institutional walls they establish how these unfold in high-incarceration neighborhoods as well, revealing the insidious set of consequences that mass incarceration holds for poor communities of color. "In this vivid, compelling, and moving study of the impact of the prison system on young people in California’s central valley, Lopez-Aguado shows how mass incarceration and its collateral consequences actually produce many of the social problems they purport to prevent. He demonstrates that the prison is not simply a stand-alone institution but rather a node in a network of criminalization that makes life outside of jails and prisons for young people very similar to what they experience on the inside. The author’s fine ethnographic ear, his impressive rapport with the young people he studies, and his mastery of a broad range of concepts and theories combine to give us a book that enables us to see the prison in a new light, to discern social relations that are often right before our eyes, but hidden in plain sight." 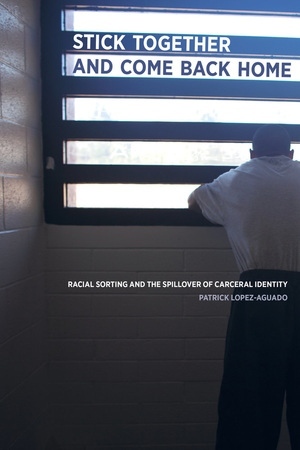 "Lopez-Aguado demonstrates how forced racial sorting within the prison shapes identities and allegiances and how these identities shape life outside the prison walls in the community as well. His analysis provides powerful and important insight into previously hidden ways that mass incarceration continues to ravage the most disadvantaged communities." —Aaron Kupchik, author of The Real School Safety Problem: The Long-Term Consequences of Harsh School Punishment and Homeroom Security: School Discipline in an Age of Fear. "This ethnography provides gripping, in-depth description combined with brilliant theoretical nuance, helping us empirically understand the specific, day-to-day processes in which the prison and the carceral state impact the lives of marginalized populations. This is truly a groundbreaking study that demonstrates how racialized prisonization becomes embodied and embedded in communities already left behind."